Scotland wing Nikki Walker will miss the World Cup after suffering a knee injury in Saturday's 23-12 win over Italy. The Ospreys back came on after 54 minutes but did not complete the match after being taken off on a stretcher with three minutes remaining following an innocuous-looking tackle. Walker went for medical assessments on the injury and a medial ligament problem was diagnosed, ruling him out of the tournament in New Zealand which begins next month. Scotland head coach Andy Robinson said: "Nikki has worked exceptionally hard in training and some of the running lines he made yesterday when he came off the bench were first-class. "It's obviously disappointing for Nikki. We all feel for him but injuries do happen in sport and you just have to deal with them. We wish Nikki a speedy recovery." And Scotland team doctor James Robson confirmed the diagnosis saying: "Nikki has sustained damage to the medial collateral ligament in his right knee. "He was seen by knee specialist, consultant Graham Lawson, at the Spire Murrayfield Hospital last night and scans revealed the specific ligament damage and additional areas of concern. Nikki will now undergo further assessment on those areas as the knee settles from the initial insult. "The assessment will take place on his return to his club, the Ospreys, under the care of the Ospreys medical team, led by Chris Towers. 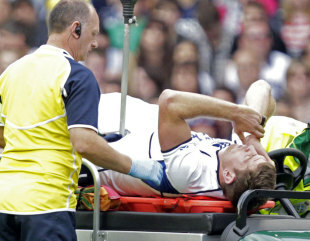 The ligament damage rules him out of selection for Rugby World Cup." The news comes as a huge blow to Robinson who is due to name his World Cup squad on Monday.